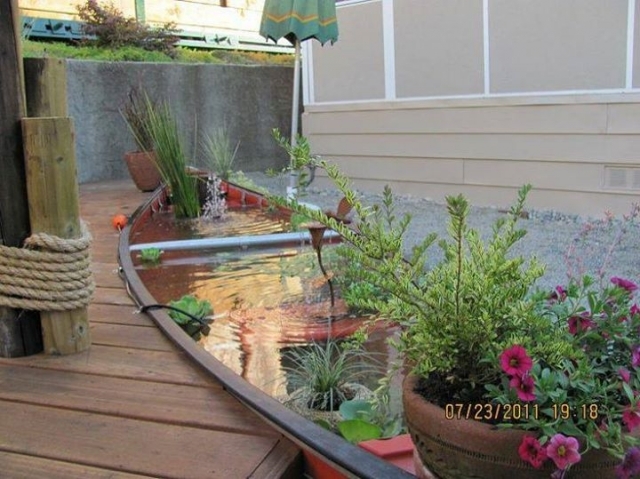 How clever is this- Canoe Pond. | A.B.E. Remodeling, INC.
Well, we have been quite busy doing projects for our clients. We appreciate each and everyone. Right now, folks are calling to try to get items done before the cold weather comes. Now on a different note, I came across this "canoe" pond and thought it was worth sharing. Some people just come up with ideas to "re-use" items. I think it is very clever. It just may be something you want to keep in mind-if nothing more, it's a conversation idea. In any event, it's also Friday and so we just want to shout out and tell everyone to have a wonderful weekend whatever you plans....get out there and enjoy. We do know that the colder days are coming. Take care. Be blessed.